Attic projects are difficult to maneuver, and can sometimes be hazardous. Sudbury Handyman Services can transform your attic from overlooked space into usable space by adding attic stairs or ladders, installing flooring in attic spaces or safely providing additional storage space for your home. Proper insulation in the attic is one of the best ways to keep your home cool in the summer and warm in the winter. 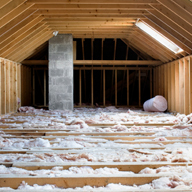 Sudbury Handyman Services can install attic insulation for an energy-efficient home.